Tōkyō: Hayakawa Publishing Inc., 1994. 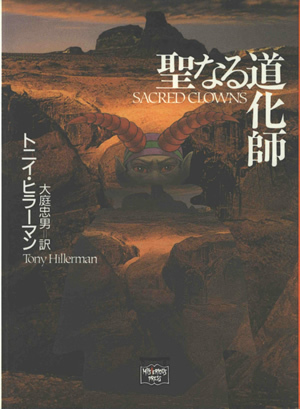 This is the full and detailed view of the dustcover of the first paperback Japanese edition of Sacred Clowns. This edition was published in 1994 by Hayakawa Publishing Inc., in Tōkyō , Japan. This edition is also associated with the Mysterious Press, which is a trademark of Warner Brothers, Inc. and was used by Hayakawa Publishing, Inc. with permission. Tony Hillerman's original text was translated from English to Japanese by Tadao Oba. This is a pocket paperback book with a dust cover and clear plastic jacket. The front cover features a composite image of a rocky landscape with a horned head emerging from the center of it. As is typical with popular press items in Japan, this edition comes with a paper publisher's ribbon with a clear plastic cover wrapped around the exterior of the title. The edition is written in Japanese kanji. Due to the fact that Japanese is read right to left the novel is printed right to left. Binding: Two-tone gray paper covers printed in gray. The publisher's logo, title, author, and publisher are printed vertically on the spine.